For those of you who got here after the Math 100 era, all you need to know is that everyone had to pass it–everyone–and that both it’s requirements and the way it was taught were rigid to the point of stupidity. Quite a few students crashed on that rock, including famously Howard Hughes. It was often brutally difficult for students who were majoring in the humanities disciplines. This all combined to engender real and sometimes very long lasting hostility towards Rice on the part of many students who went through it whether they passed or not. Albert Sundermeyer graduated in 1954 and he had been the General Manager of that year’s Engineering Show, a real honor. I’d just note one thing here–the review lasted five hours on a Sunday afternoon and enrollment was limited to 100! These days, that is big business on-line. Just this morning, I spent an hour with that team talking about search relevance for matching students to tutors. And my son is tutoring human physiology at Willamette University. 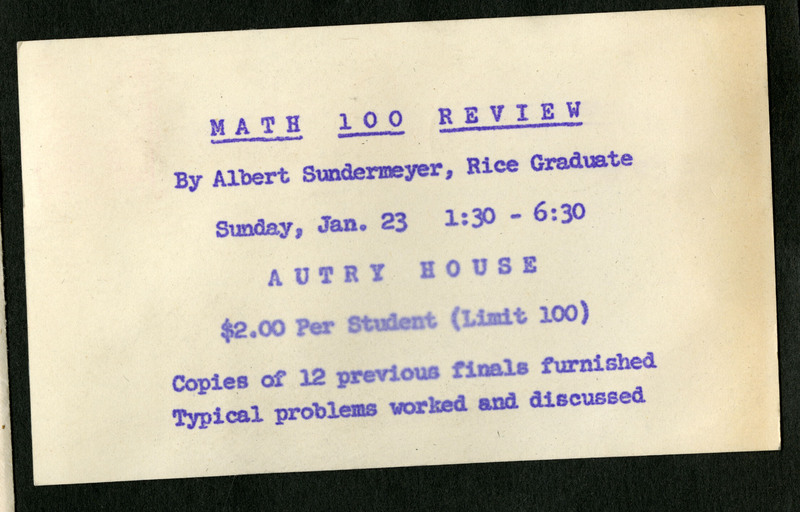 It’s interesting how big a role Autry House played in Rice student life before the Rice Memorial Center was built.